The Ateneo de Manila University (est. 1859) and Regis University of Denver, Colorado (est. 1877), share a long and storied Jesuit tradition of excellence and service. It is therefore unsurprising that these two institutions, with so much in common, should come together and draw on their areas of relative expertise to come up with a collaborative program, the Ateneo-Regis MBA. Bachelor’s degree from government-recognized institution in any field of study. Undergraduate weighted grade point average of 85% or B. Applicants who do not meet this requirement but satisfy other admission requirements may still pursue their application subject to further evaluation and final decision of the Admissions Committee. 1. Go to http://gsb.ateneo.edu and click on the “APPLY ONLINE” link, which can be found at the upper right portion of the Webpage. Completely fill out the Online Application Form. Upon reaching the last page of the application form, take note of the username and password or print it out for your reference. 2. Click on the “DOWNLOAD RECOMMENDATION FORM” button that can be found at the bottom of the page and print out 2 copies, one each for your two recommenders. Ask them to fill up the form completely, and return to you in a sealed envelope with their signature across the flap. 2 recent passport-size colored ID pictures. 4. You will be issued an Entrance Examination Permit once the submitted requirements have been validated. Take the exam on the scheduled date. 5. Come for admissions interview, as may be required. 6. Wait for the Office of the Registrar to inform you of the decision of the Admissions Committee on your application, which will be sent via the email address that you provided on your Online Application Form. Please expect a response in 4 to 5 weeks. 7. New students admitted to the Program will be required to sign the Admission Letter at the Office of the Registrar or with the respective Site Assistants at the Satellite Campuses. 8. Attend the Orientation Seminar (ORSEM) which is scheduled at the beginning of each trimester. The Ateneo-Regis MBA Program is a non-thesis program designed for senior managers and executives whose corporate responsibilities limit their time for pursuing graduate degrees and are thus compelled to complete the program as quickly as possible through accelerated methods. The program is also designed for senior practitioners whose learning styles and outcomes are achieved through their own direct participation in learning activities without too much classroom interface. Each term of the Ateneo-Regis MBA Program lasts for eight (8) weeks. Each course meets once a week for four (4) hours from 6:00pm to 10:00pm. The maximum number of students per class is twenty-five (25) except for Strategic Management and Quantitative Methods in Management where the maximum number of students per class is twenty (20). The regular load is one (1) subject per term, but a maximum of two (2) courses is allowed. The program can be completed in two (2) years and two (2) terms if one (1) course is taken per term. If two (2) courses are taken per term, the program can be completed in fourteen (14) months, or one (1) year and one (1) term. Each course has a detailed learning guide (module) for the entire course. The module serves as the road map for both the students and their professors. Each meeting haswell-defined goals and objectives. The reading materials and cases for each session are provided prior to the start of each class session. The curriculum for the Ateneo-Regis MBA Program includes analytical learning through time intensive courses designed specifically for working adults. The design of the courses recognizes that adults learn most effectively and most rapidly through a process of self-learning, bringing both life and work experiences that can be a learning resources for the other students in the class. Self-learning occurs before class so that each participant can contribute in a meaningful way to group discussions and be an effective resource in shared-learning. Shared-learning occurs in the classroom, where each participant learns from the life and professional experiences of others. Each adult learner must be an active participant in the learning process. The principal responsibility of the facilitator is to assist in this process, not to teach the technical content of the course. The facilitator is a technical expert in the field and will answer questions beyond the competence of the participants, but the primary responsibility for learning belongs to the student. Ordinarily, the facilitator will not lecture for an extended period of time. Many business schools in the world today require Business Ethics courses in order to develop the students’ sense of moral and social responsibility. There is a growing recognition that managers have a tremendous power to shape not only business organizations, but the community as well. Recognizing this, the public is increasingly demanding that managers use this power responsibly and that business be accountable not only to its stockholders and internal stakeholders, but to society at large. It is said that business is good for society since it creates wealth, products, and services benefiting human beings. But white-collar crimes, wrongdoing, and excesses committed by both individuals and business organizations often overshadow these goals. The course will discuss the foundations of ethics in general and of business ethics in particular to critically examine moral values and principles. The course will help students understand how moral character is developed and to improve their ethical decision-making by presenting a model for ethical reasoning to analyze dilemmas involving employee relations, employee-organization relations, and corporation-employee, and corporation-community relations. Through this course, students will learn that business should not be purely driven by profit but that it should contribute to the well-being of employees and the community in which it operates. The course introduces the students to a depth of thinking about individuals and collective patterns of leadership practices. The course will guide students to reflectively process or understand leadership patterns and dynamics as applied in their personal and professional lives. Critical thinking and ethics-based reasoning and decision making are emphasized. The course introduces the students to quantitative and statistical methods and models that will enhance business decision-making processes. Topics include mathematical modeling, linear programming, probability, decision theory, PERT/CPM, forecasting, inventory management, queuing theory, and monte-carlo simulation techniques. The course is designed to provide students with an understanding of the concepts, techniques, and applications of contemporary production and operations management (OM). It is a practical course that covers strategic, tactical and operational issues involved in both manufacturing and service operations. In addition to the traditional OM topics, the course also includes quality management, supply chain management and e-Commerce. Managers need information in their planning and control functions. Financial information is necessary not only to determine the financial position and operating results of a firm but also to help managers make decisions on how best to optimize the resources entrusted to it by its many stakeholders. Resources are measured in terms of cost, and effective cost management is vital to ensure the best possible profit and return to the firm. The course is a study of accounting and cost management concepts. The topics include the analysis of financial statements, cost constructs and cost accumulation methods, the relationship of cost, volume, price and mix and how they can increase margins, variable costing, standard costing, operational and capital budgeting, segment reporting, relevant costing, and cost control strategies. In discussing the various topics emphasis will be given on decision making, its ethical implications especially on the quality and reliability of information, and its impact on business and national development. The course deals with the application of contemporary finance theory to the solution of management problems. The focus is on policy formulation and decision-making under uncertainty. Critical evaluation of concepts is emphasized to assess their usefulness in practical business situations. Problem-solving methodology is used to illustrate the theories and tools in financial decision-making. The course likewise tackles the ethical issues and dilemmas faced by the finance manager in his day-to-day work and how these are solved. The learners will be taught how to resolve these issues using an ethical decision analysis framework. The course also discusses the implications of financial management decisions in the life of the enterprise and how such impacts the national economy as a whole. The course is designed to provide the foundation for the development of knowledge and skills in professional management in different organizational settings. It focuses on the key management functions of planning, organizing, leading and controlling in building a dynamic business portfolio. It will develop skills in integrating technology, ethics and social responsibility, in responding to the transforming situations and challenges of the real world. The course emphasizes the alignment of Human Resource Management practices and programs with the goals and strategies and values of the organization. This course presents powerful tools for analyzing strategic alignment that will enable the learner to understand the most vital resource of the organization – its human resources. It provides a fresh perspective on the role of HR and its function as change agent in partnership with top management and how together, they can build one of the most critical sources of sustainable competitive advantage – an organization whose design, culture, and people are aligned with strategy and values. It addresses human resource topics such as reward systems, performance management, high-performance human resource systems, training and development, recruitment, retention, work-force relationships from a strategic standpoints. Information systems and technologies are vital components of successful businesses and organizations. They constitute an essential field of study in business administration and management. The course presents management concepts that lead to an understanding of information technology and its role within the enterprise. It includes enhancing awareness of the digital and economic divide within a nation and how a business performs its economic activities while at the same time investing in marginalized sectors and communities. Building consensus among business and technology professionals using modern approaches to strategic planning, business process re-engineering and systems development are discussed highlighting the ethical and legal principles that impact this environment. The goal is to help students learn how to use and manage information technologies to revitalize business processes, improve decision making and gain competitive advantage. Major emphasis is placed on up-to-date coverage of the essential role of the IT in providing a platform for business, commerce and collaboration processes among all business stakeholders in today’s networked enterprises and global markets. The course is designed to provide learners with knowledge on the fundamental concepts and practices of Marketing in the context of the new economy. It will focus on the formulation and implementation of marketing strategies in the areas of brand equity, products and services, pricing, distribution, advertising and promotion, and competition. These strategies will be discussed considering the current business environment including such realities such as hyper competition, digitalized technologies and the empowered consumer. The course will also help learners gain a good understanding of administrative processes where Marketing plays a central role in the game of demand creation, customer satisfaction and customer relation management. Furthermore, it will also show how ethical and socially responsible Marketing practices can help in nation-building. The course focuses on the basic economic concepts and principles as applied to business situations. Microeconomic concepts such as scarcity, opportunity costs, marginalism, and efficiency will never lose their central role in economics as long as scarcity itself exists. Macroeconomic concepts like GDP and GNP, employment and unemployment, inflation and deflation, balance of payments and foreign exchange rates will remain to be the primary concerns of all economies. These micro and macro concepts are integrated into a framework that will assist business leaders and managers in coping with the challenges arising from changes in a competitive business environment. The course will provide students with a working knowledge and skills of how consumers, firms and industries behave in a complex macroeconomic environment, thus helping them arrive at rational, optimal, and efficient choices. These informed choices when added up to the choices that other people make, translate into better societal choices. Demand Management is an approach employed by supply chain managers to see to it that business needs are appropriately satisfied and resources are utilized in optimal ways. This elective course is designed to study the operational and strategic management of demand and to examine the role of supply chain practitioners in this area with the objective of improving organization’s competitiveness. The course will tackle the crucial and practical elements associated with specifying requirements and planning supply, and will present tools that supply chain managers can use in performing their functions. The course deals with the economics of long-term growth and development. It focuses on areas and issues of policy-making that are likely to remain of primary concern in the efforts of underdeveloped and developing countries to achieve economic growth and development. The course is designed to guide managers through the process of overcoming the fear of change and embracing the benefits of e-commerce for customers, employees and shareholders. The economic evidence of the growth of e-commerce and its benefits for streamlining the business relationships between a company and its customers, suppliers, and employees are examined. The highest pay-off e-commerce applications and principles of using e-commerce to create competitive advantage are identified. How companies are getting CEOs on board, how they are managing their change process to create effective e-commerce strategies, and how they create cultures that can sustain the benefits of change in the future are discussed. Entrepreneurship is the ability to see opportunities where others see only problems, to turn those opportunities into an actual business venture, and to manage that venture into growing, viable enterprise. Entrepreneurship is for those who see an alternative to employment and are not daunted by the challenges of setting up their own business. This course will strive primarily to inspire and to encourage entrepreneurship, through the examination, discussion and analysis of contemporary entrepreneurs. Furthermore, to ensure the viability of any entrepreneurial venture, this course will provide a framework of evaluation techniques to apply and pertinent issues to consider, when investigating business opportunities. The focus on this course is on relatively small businesses, from inception to start-up to early establishment. Family businesses compose most of enterprises operating in the country. Their success contributes to its over-all economic health. Understanding how they are managed, including the dynamics of the family within the business, adds to help maintain the healthiness of the enterprise. The course will expose the students on the dynamics and communication issues in a family. They will learn leadership and relationships inherent in the business and how these are intertwined in the ownership, governance and management of the same. Ownership legacy, sibling rivalries, professionalism, succession, and strategic planning are some of the topics that will be covered in this course. Family businesses in the Asian context will be discussed in line with their successes and failures. The course deals with the understanding and analysis of financial information for decision-making. The importance of financial information has never been emphasized until the issues of transparency, good corporate governance, and investor relations cropped up as corporate scandals. Because of the uncertainty brought about by the chaotic environment, there is need for more accurate financial information on a timely basis so that corporate financial management decisions and investor decisions will be guided. Critical analysis, diagnosis, and evaluation of financial information are emphasized in this course as applied in practical business situations. Problem-solving methodology is used to illustrate the theories and tools in financial decision-making including the use of technologies to help with the analysis. Because of the impact of transparency in corporate and investor relations, this course will tackle the ethical issues and dilemmas involving financial information and reporting. Financial Engineering is a course on the basic concepts and the application of the principles of financial innovation – the process that seeks to adapt existing financial instruments and processes and to develop new ones so as to enable financial market participants to cope more effectively with the changing world. This course presents the challenges of marketing goods and services in foreign markets. The cultural, political, geographic, technological, and economic influences on international marketing will be discussed. This course also covers international market research and the application of the four P’s in an international setting. 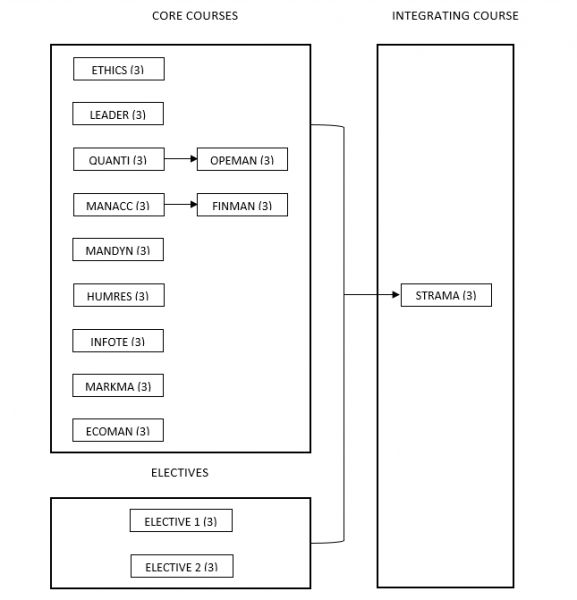 Students are expected to assimilate this new knowledge in analyzing international marketing management problems, using techniques and strategies necessary to incorporate and apply “the market concept” into the framework of the global marketplace. The course introduces the concept of Integrated Marketing Communications (IMC), which is the approach that more and more marketing and communications professionals are using to face the rapid growth of internet, the biggest challenges in the contemporary market place. An increased rate of advertising clutter in most traditional media, a more product knowledgeable and demanding consumer, higher pressures from manufacturers to retail chains and a global economy are only a few characteristics of today’s ever-evolving business environment. The course will provide a review of the basic concepts of marketing, communications, segment marketing, positioning, and target market or to apply the most common consumer behavior techniques. It will also provide an opportunity for students to understand the target market(s) and, design an IMC campaign. The course deals with the application of the principles of investment analysis and portfolio management to corporate and personal finances. The steps and procedures involved in the investment process are discussed and simulated by the students to provide them with skills at creating their own corporate or personal investment portfolios in the future. Risk and return management strategies are discussed and analyzed as they apply not only to the global investment setting but also to the specific investment situations in the Philippine market. The ethical dimensions of investment decisions will also be tackled as part of this course. The course introduces the learner to the various laws that are relevant in the business environment. The course equips the student with an understanding of how business decisions and operations are directly influenced by law. In the first half of the course, the student will study the law on Contracts, Credit Transactions, Labor-Management Relations as well as Partnerships and Corporations for the purpose of attaining a working familiarity with basic legal concepts and principles. For the rest of the course, the emphasis will be on Good Corporate Governance. Here, the student will study the recent issuance of the SEC regarding corporate governance and how it impacts on the way corporations are run. The course will provide students with competence on how to lead change. The course will explore the dynamics of organizational change as well as models of leading organizational change in business and management. Various concepts will be learned including the forces and the conditions behind organizational change, the types and levels of change, the resistance to change and the constructive strategies necessary to manage the uncertainties of change in organizations. The course takes the view of the project manager as a leader who manages projects effectively using appropriate tools and concepts in project management. It provides a framework for managerial and leadership effectiveness leading to the acquisition of professional skills to handle complex problems frequently encountered in project management. It involves the study and understanding of the core processes for initiating, planning, executing, controlling and closing projects under various circumstances. The course also includes the human side of project leadership and its strategic perspectives as applied in various types of organizations. The conceptual framework, the methodologies and the issues that will be highlighted in this course can be applied to a number of business decisions and change management situations. Both the theoretical and practical aspects of such applications will be covered. The project environment is a team environment and a significant component of this course is team-based. With the guided learning offered in this course, the students are expected to be able to tackle projects in a controlled and coordinated manner and be aware of how to align their projects to achieve maximum benefits during execution. The course covers the concepts of Lean and Six Sigma for both manufacturing and service businesses. Lean Six Sigma is a business and data-driven, process-oriented, benefit-driven, disciplined-based approach to reducing waste and minimizing defects in any type of process. Lean Six Sigma focuses on the reduction of waste, on increasing profitability, breakthrough improvement, and customer satisfaction. Students are provided an overview of Lean, Six Sigma and the DMAIC problem-solving methodologies. Included are both statistical and non-statistical techniques used for continuous process improvement such as process definition, SIPOC, process flow diagrams, data collection techniques, measurement techniques, causes of process variation, pareto diagrams, histograms, cause and effect diagrams, DOE (Design Of Experiments), ANOVA Gage R&R, FMEA control charts and process capability analysis, collectively called QC Tools. The course covers concepts, trends, processes and techniques involved in the management of activities from the procurement of materials and services, to their transformation into intermediate goods or final products, and ultimately to their distribution and delivery to customers. The course will discuss procurement, inbound logistics, supply chain strategies, electronic procurement and warehousing and distribution. It will deal with managerial processes that span across functional areas within individual firms and links suppliers, trading partners, distributors, and customers across organizational boundaries. The course will also consider logistics, technology, network design, and administration of supply chains from the standpoint of business strategy and global competition. The course serves as the capstone course for the MBA program. It aims to enable the learners to develop and implement cross-functional decisions towards the attainment of their organizations’ vision, mission and objectives using strategic management principles and integrating knowledge and skills learned from the other MBA courses. The learners will apply the strategic management process consisting of strategy formulation, strategy implementation and strategy evaluation, as well as the various analytical frameworks and strategy formulation tools that can aid them in decision making. Through this course, the learners’ strategic thinking capability is expected to be strengthened as they are made to critically analyze and integrate information about their companies’ external and internal environment in the local and global context, and to use this in formulating and implementing innovative strategies that can help their companies build a sustainable competitive advantage. The learners will likewise be made to understand the different strategy choices and to evaluate strategic management issues and concepts that are important to managing in today’s global environment. This course also aims to promote among its learners ethical business decisions, the practice of corporate social responsibility and making a contribution towards nation building. How many subjects are required to finish the Ateneo-Regis MBA Program? A total of 14 courses are required to complete the program: 12 core courses and 2 elective courses. Please refer to the attached list of core and elective courses offered under the Ateneo – Regis MBA Program. This is a non-thesis program. The terminal requirement is a Strategic Management paper which will be defended before a panel of three experts. How many hours are spent in the classroom per week? Each course is made up of 8 weekly sessions of 4 hours each, for a total of 32 contact hours. The Regis program runs a total of five 8-week terms per year. How long will it take a student to finish the requirements of the program? Students who take two courses per eight-week term can complete 10 courses in a year, and can thus complete the program in one year and four months. Most students take only one course per eight-week term and thus finish in 14 terms, or 2 years and 10 months. How much is the total cost of the program? The Ateneo-Regis MBA is offered at our main campus in Rockwell Center, Makati City and at four satellite campuses all over the country: Sta. Rosa, Laguna; Clark Field, Pampanga; Cebu City; and Iloilo City.